Silicon Quantum Computing (SQC) Pty Ltd will develop and commercialise a prototype circuit, which will serve as a "forerunner to a silicon-based quantum computer" the company said. The NSW Government today said it had pledged $8.7m towards the venture, the money coming from its Quantum Computing Fund which was announced in July. SQC’s board is made up of Michelle Simmons, UNSW Professor of Physics and director of the CQC2T; Hugh Bradlow, Telstra’s chief scientist; David Whiteing, Commonwealth Bank of Australia’s chief information officer; and Glenys Beauchamp, secretary of the Department of Industry, Innovation and Science. 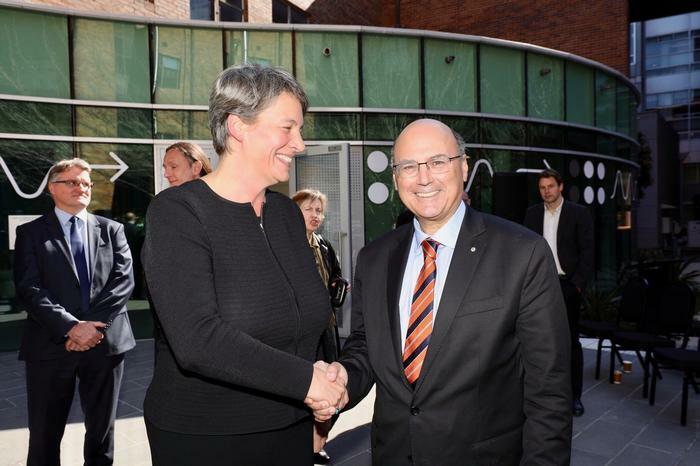 Michelle Simmons, UNSW Professor of Physics and director of the CQC2T with Senator Arthur Sinodinos, Minister for Industry, Innovation and Science at the company launch. “We have a board which is very corporately focused, on developing and funding the engineering work to develop a ten qubit device. We will fund hardware. From that we will develop a patent pool which we hope will be without peer in the world,” Menzies said. “The company will need additional moneys, and the business plan contemplates it will have additional shareholders who will join. All of whom we hope will bring strategic focus to the business and company, and also will bring their own enthusiasm and passion for quantum technologies,” Menzies added. SQC – which will operate within the Centre for QTC at UNSW in Sydney – has already started recruiting for forty roles, including 25 postdoctoral researchers, 12 PhD students, and a number of lab technicians. Telstra’s Hugh Bradlow reiterated the telco’s aim, revealed in June, to offer quantum computing to customers ‘as-a-service’. “Everyone knows that Telstra aims to be a globally leading technology company and if we’re going to do that we have to be at the forefront of 21st Century computing. [When realised] our customers are going to have access to a computer of unprecedented power and they’re not going to have the faintest idea of how to use it. So it’s Telstra’s aim to be in a position that, when that happens, we are skilled and knowledgeable about how to deliver those services to our customers. We look forward to taking [SQC’s] products and putting them into our cloud services offerings in the future,” he said. “Quantum computing is a revolutionary technology. It will transform the world as we know it. We’ve invested more than $14m in quantum computing, because we believe in its future promise, we believe in its future capability, we believe in its potential as a differentiator. Not just for those of us involved, but also for Australia in general,” he said. "As a country we punch above our weight when it comes to knowledge creation but we really need to be doing more when it comes to commercialising our great ideas here in Australia. It’s very important we do that. That’s not to say we commercialise every idea in this country but too many ideas do go offshore,” Sinodinos said. The SQC is now part of a global race to build a quantum computer, building on the silicon-based approach of the CQC2T. Researchers at Google’s Quantum AI Laboratory said in a March Nature editorial that the company would “commercialise quantum technologies within five years”. In the same month, IBM announced its commercial 'Q' quantum computing program would deliver paid quantum computing services via the cloud to users before the end of the year. Microsoft, however, told Computerworld in July that it was “still trying to figure out” a business model for the technology.